Not to be confused with George Papadopoulos. Georgios Papadopoulos (/ˌpæpəˈdɒpəlɒs/; Greek: Γεώργιος Παπαδόπουλος [ʝeˈorʝios papaˈðopulos]; 5 May 1919 – 27 June 1999) was the head of the military coup d'état that took place in Greece on 21 April 1967, and leader of the junta that ruled the country from 1967 to 1974. He held his dictatorial power until 1973, when he was himself overthrown by his co-conspirator Dimitrios Ioannidis. Papadopoulos was a Colonel of the Artillery. During World War II, he initially resisted the Italian 1940 invasion but later became an active Axis collaborator in the Security Battalions which "hunted down" Greek resistance fighters. Papadopoulos was born in Elaiohori, a small village in the Prefecture of Achaea in Peloponnese to local schoolteacher Christos Papadopoulos and his wife Chrysoula. He was the eldest son and had two brothers, Konstantinos and Haralambos. After finishing high school in 1937 he enrolled in the Hellenic Military Academy, completing its three-year program in 1940. His biographical notes, published as a booklet by supporters in 1980, mention that he took a civil engineering course at the Polytechneion but did not graduate. During World War II. Papadopoulos saw field action as an artillery second lieutenant against both Italian and Nazi German forces which attacked Greece on 6 April 1941. During the subsequent occupation of Greece by Nazi Germany, Italy and Bulgaria, he worked in the Greek administration's "Patras Food Supply Office" under the command of Colonel Kourkoulakos, who was responsible for the formation of the "Security Battalions" in Patras which "hunted down" Greek resistance fighters. These were collaborationist military units created by the Greek puppet government of Ioannis Rallis in 1943 to support the German occupation troops. They were supported by the extreme right and pro-Nazi elements, but also by some centrist politicians who were concerned about the dominance of ELAS (the military arm of the communist-dominated National Liberation Front EAM) as the leading group in the Greek resistance. Among the members of the Security Battalions one could find ex-army officers, violently conscripted soldiers, ultra-right fanatics and social outcasts, as well as common opportunists who believed the Axis would win the war. At the beginning of 1944, Papadopoulos left Greece with the help of British intelligence agents and went to Egypt, where the Greek government-in-exile was based, and was promoted to lieutenant. Along with other right-wing military officers, he participated in the creation of the nationalist right-wing secret IDEA organization in the fall of 1944, shortly after the country's liberation. Those 1940B officers who took refuge in Egypt with the king immediately after the German invasion had become generals when their still-colonel classmates undertook the coup of 1967. Papadopoulos married his first wife, Niki Vasileiadi, in 1941. They had two children, a son and a daughter. The marriage, however, ran into difficulty later and they eventually separated. The separation, however lengthy, could not lead to divorce at first because, under Greece's restrictive divorce laws of that era, spousal consent was required. To remedy this, in 1970, as Prime Minister of the dictatorship he decreed a custom-made divorce law with a strict time limit (and a built-in sunset clause) that enabled him to get the divorce. After having served its purpose, the law eventually expired automatically. After the divorce, Papadopoulos married his long-time paramour Despina Gaspari in 1970, with whom he had a daughter. He was promoted to captain in 1946; and in 1949, during the Greek Civil War, to major. (See also Greek military ranks.) He served in the KYP Intelligence Service from 1959 to 1964 as the main contact between the KYP and the top CIA operative in Greece, John Fatseas, after training at the CIA in 1953. Papadopoulos was also a member of the court-martial in the first trial of the well-known Greek communist leader Nikos Beloyannis, in 1951. At that trial, Beloyannis was sentenced to death for the crime of being a member of the Communist Party, which was banned at that time in Greece following the Greek Civil War. The death sentence pronounced after this trial (Papadopoulos had voted against it) was not carried out, but Beloyannis was put on trial again in early 1952, this time for alleged espionage, following the discovery of radio transmitters used by undercover Greek communists to communicate with the exiled leadership of the Party in the Soviet Union. At the end of this trial, he was sentenced to death and immediately taken out and shot. Papadopoulos was not involved in this second trial. 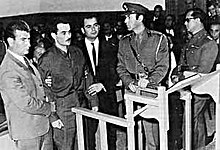 The Beloyannis trials were highly controversial in Greece, and many Greeks consider that, like many Greek communists at the time, Beloyannis was shot for his political beliefs, rather than any real crimes. The trial was by court-martial under Greek anti-insurgency legislation enacted at the time of the Greek Civil War which remained in force even though the war had ended. In 1964, Papadopoulos was transferred to an artillery division in Thrace by decree of Center Union Defense Minister Garoufalias. In June 1965, days before the onset of the major political turmoil known as Apostasia, he made national headlines after arresting two soldiers under his command and eight leftist civilians from settlements near his military camp, on charges that they had conspired to sabotage army vehicles by pouring sugar into the vehicles' gas tanks. The ten were imprisoned and tortured, but it was eventually proven that Papadopoulos himself had sabotaged the vehicles. Andreas Papandreou wrote in his memoirs that Papadopoulos wanted to prove that under the Center Union government, the communists had been left free to undermine national security. Even after this scandal, Papadopoulos was not discharged from the army since prime minister Georgios Papandreou forgave him as a compatriot of his father. In 1967, Papadopoulos was promoted to colonel. That same year, on 21 April, a month before the general elections, Papadopoulos, along with fellow middle-ranking Army officers, led a successful coup, taking advantage of the volatile political situation that had arisen from a conflict between King Constantine II and the aging former prime minister, Georgios Papandreou. Papadopoulos used his power gained from the coup to try to re-engineer the Greek political landscape. Papadopoulos as well as the other junta members are known in Greece by the term "Aprilianoi" (Aprilians), denoting the month of the coup. The term "Aprilianoi" has become synonymous with the term "dictators of 1967 - 1974". Constantine appointed a new government nominally headed by Konstantinos Kollias. However, from the early stages, Papadopoulos was the strongman of the new regime. He was appointed Minister of National Defense and Minister of the Presidency in the Kollias government, and his position was further enhanced after the king's abortive counter-coup on 13 December, when he replaced Kollias as Prime Minister. Not content with that, on 21 March 1972, he nominated himself Regent of Greece, succeeding Georgios Zoitakis. Papadopoulos' regime imposed martial law. The press was subjected to harsh censorship. Thousands of the regime's political opponents were thrown into prison or exiled ("forced into vacation", as the friends of the junta cynically put it) on small Aegean islands. Amnesty International issued a report detailing numerous instances of torture under the regime. Papadopoulos excused these actions as necessary to save the nation from a "Communist takeover." The regime was supported by the United States because of its staunchly anti-Communist stance. The military government dissolved political parties, clamped down on left-wing organizations and labor unions, and promoted traditionalist Greco-Christian culture. At the same time, however, the economy, mostly due to the political stability brought by the regime, improved greatly. Extensive public projects, such as highway-building, agricultural reform and electrification, were carried out all over Greece, especially in the most backward rural areas. Torture of political prisoners in general, and communists in particular, was not out of the question. Examples included severe beatings, isolation and, according to some sources, pulling out fingernails. Αι υποχρεώσεις μας περιγράφονται και από την θρησκείαν και από την ιστορίαν μας. Ομόνοιαν και αγάπην διδάσκει ο Χριστός. Πίστιν εις την Πατρίδα επιτάσσει η Ιστορία μας. [...] η Ελλάς αναγεννάται, η Ελλάς θα μεγαλουργήσει, η Ελλάς πάντα θα ζει. Our obligations are described by both out history and our religion. Christ teaches Harmony and Love. Our history demands faith in our country. [...] Greece is being reborn, Greece will accomplish great things, Greece will live forever. Alexandros Panagoulis on trial by the junta Justice System. A failed assassination attempt against Papadopoulos was perpetrated by Alexandros Panagoulis in the morning of 13 August 1968, when Papadopoulos was driven from his summer residence in Lagonisi to Athens, escorted by his personal security motorcycles and cars. Panagoulis ignited a bomb at a point of the coastal road where the limousine carrying Papadopoulos would have to slow down, but the bomb failed to harm Papadopoulos. Panagoulis was captured a few hours later in a nearby sea cave, since the boat sent to help him escape was instructed to leave at a specific time and he couldn't swim there on time due to strong sea currents. After his arrest, he was taken to the Greek Military Police (EAT-ESA) offices where he was questioned, beaten and tortured. On 17 November 1968, Panagoulis was sentenced to death but was personally pardoned by Papadopoulos, served only five years in prison, and after democracy was restored was elected a member of Parliament. He was regarded as an emblematic figure of the struggle to restore democracy, and as such has often been paralleled to Harmodius and Aristogeiton, two ancient Athenians known for their assassination tyrannicide of Hipparchus. "Our Credo" by Georgios Papadopoulos. It was a multi-volume collection of speeches, declarations, messages and other published material by the dictator. Papadopoulos had indicated as early as 1968 that he was eager for a reform process, and even tried to contact Spiros Markezinis at that time. He had declared at the time that he did not want the Revolution of April 21 to become a 'regime'. Several attempts to liberalize the regime during 1969 and 1970 were thwarted by the hardliners on the junta, including Ioannides. In fact, subsequent to his 1970 failed attempt at reform, he threatened to resign and was dissuaded only after the hardliners renewed their personal allegiance to him. As internal dissatisfaction grew in the early 1970s, and especially after an abortive coup by the Navy in early 1973, Papadopoulos attempted to legitimize the regime by beginning a gradual "democratization" (see also the article on Metapolitefsi). On 1 June 1973, he abolished the monarchy and declared Greece a republic with himself as president. He was confirmed in office via a controversial referendum. He furthermore sought the support of the old political establishment, but secured only the cooperation of Spiros Markezinis, who became Prime Minister. Concurrently, many restrictions were lifted and the army's role significantly reduced. An interim constitution created a presidential republic, which vested sweeping—almost dictatorial—powers in the hands of the president. The decision to return to (at least nominal) civilian rule and the restriction of the army's role was resented by many of the regime's supporters, whose dissatisfaction with Papadopoulos would become evident a few months later. After the events of the student uprising of 17 November at the National Technical University of Athens (see Athens Polytechnic uprising), the dictatorship was overthrown on 25 November 1973 by hardline elements in the Army. The outcry over Papadopoulos's extensive reliance on the army to quell the student uprising gave Brigadier Dimitrios Ioannidis a pretext to oust him and replace him as the new strongman of the regime. Papadopoulos was put under house arrest at his villa, while Greece returned to an "orthodox" military dictatorship. After democracy was restored in 1974, during the period of metapolitefsi ("regime change"), Papadopoulos and his cohorts were tried for high treason, mutiny, torture, and other crimes and misdemeanors. On 23 August 1975, he and several others were found guilty and were sentenced to death, which was later commuted to life imprisonment. Papadopoulos remained in prison, rejecting an amnesty offer that required that he acknowledge his past record and express remorse, until his death on 27 June 1999 at age 80 in a hospital in Athens, where he had been treated for cancer since 1996. Today, Papadopoulos is a symbol of authoritarianism and xenophobia. The far right praises him for promoting Greek culture, imposing a strong hand and fighting communism. After the restoration of democracy, some support for his type of politics remained which was, for a time, bolstered by the National Political Union (EPEN), a small political party that declared him its honorary leader. EPEN eventually dissolved, with supporters scattering to various other political parties such as the Popular Orthodox Rally (LAOS) and Golden Dawn (XA). This page is based on the Wikipedia article Georgios Papadopoulos; it is used under the Creative Commons Attribution-ShareAlike 3.0 Unported License (CC-BY-SA). You may redistribute it, verbatim or modified, providing that you comply with the terms of the CC-BY-SA.